Read Mode: Display pages that require you to slide them horizontally to view adjacent pages. Web Layout: Display your document exactly as it would appear if you saved it as a web page. Outline: Display your document as outline headings and subheadings. Draft: Display the document without top or bottom page margins and with page breaks as dotted lines. Click the view icons in the bottom-right corner of your document window. The only view icons in the bottom-right corner of the document window are Read Mode, Print Layout, and web Layout. Click the View tab and then click the view you want to use, such as Print Layout or Draft view. Print Layout view can help you edit and create the design of your pages, including page margins and headers and footers. If you want to focus on writing and not see your page margins or headers and footers, you may be happier switching to Draft view instead. The two most unusual views are Read Mode and Outline views. Read Mode can be handy for making text easier to read just the way you’d see it a book. To turn the pages of a document displayed in Read Mode view, click the Previous Screen or Next Screen icon on the left and right edge of the screen, respectively. Read Mode view lets you read a document in the form of an open book. Click the Print Layout or web Layout icon in the bottom-right corner of the screen. Outline view divides a document into sections defined by headings and text. A heading represents a main idea. Text contains one or more paragraphs that are “attached” to a particular heading. A subheading lets you divide a main idea (heading) into multiple parts. A typical outline might look like this. A typical outline consists of headings, subheadings, and text that you can expand or collapse to hide subheadings or text. Collapse headings to hide parts (subheadings and text) temporarily from view. Rearrange headings to move subheadings and text easily within a large document. Moving a heading automatically moves all subheadings and text. Instead of cutting and pasting multiple paragraphs, Outline view lets you rearrange a document by just moving headings around. To switch to Outline view, click the View tab and then click the Outline icon. Move the cursor to the line that you want to define as a heading or text. Click in the Outline Level list box and choose a heading level, such as Level 2. Word displays Level 1 headings in large type justified to the far-left margin. Level 2 headings appear in smaller type that’s slightly indented to the right, Level 3 headings appear in even smaller type that’s indented farther to the right, and so on. The nine heading levels available. To create a heading quickly, move the cursor to the end of an existing heading and press Enter to create an identical heading. For example, if you put the cursor at the end of a Level 3 heading and press Enter, Word creates a new blank Level 3 heading. When you raise a heading from one level to another (such as from Level 3 to Level 2), that’s promoting. When you lower a heading (such as from Level 4 to Level 5), that’s demoting. A Level 1 heading cannot be promoted because Level 1 is the highest heading. Likewise, a Level 9 heading cannot be demoted because Level 9 is the lowest heading. Using either the mouse or the keyboard, move the cursor to the heading you want to promote or demote. Click the Outline Level list box and then click a level (such as Level 2). Press Tab to demote the heading or Shift+Tab to promote the heading. Click the Promote or Demote arrow. Move the mouse pointer over the circle that appears to the left of the heading, hold down the left mouse button, drag the mouse right or left, and then release the left mouse button. Promoting or demoting a heading automatically promotes or demotes any subheadings or text attached to the promoted or demoted heading. That way the subheadings or text maintain the same relationship to the heading. Click the Move Up or Move Down arrow icons on the Outlining tab. Move the mouse pointer over the circle that appears to the left of the heading, hold down the left mouse button, drag the mouse up or down, and then release the left mouse button. Move the cursor to the end of a heading or subheading. This is the heading (or subheading) that your text will be attached to if you move the heading (or subheading). Word creates a blank heading. Click Demote to Body Text icon (the double arrow pointing to the right) or click in the Outline Level list box and choose Body Text. 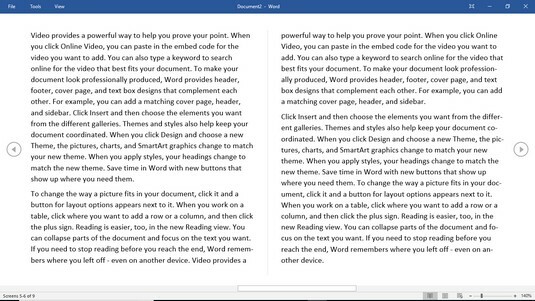 Word displays a bullet point, indented below the heading you chose in Step 1. If a heading or subheading contains any subheadings or text below, you can collapse that heading. Collapsing a heading simply hides any indented subheadings or text from view temporarily. Expanding a heading displays any previously hidden subheadings or text. To collapse a heading along with all subheadings or body text below it, double-click the plus (+) icon that appears to the left of the heading. Move the cursor anywhere in the heading that you want to collapse, and then click the Collapse (minus sign) icon. Press Alt+Shift+ + (plus sign key). To expand a collapsed heading to reveal all subheadings and body text, double-click the plus icon that appears to the left of the heading. Move the cursor anywhere in the heading that you want to expand, and then click the Expand icon (a plus sign inside a circle). Press Alt+Shift+ – (minus sign key).